Mumbai Indians will be welcoming the Kings XI from Punjab for the 24th match of IPL 2019 which will be played at the Wankhede stadium in Mumbai. Momentum is backing both the teams as both have won their last few matches. Mumbai beat CSK and SRH in their last two encounters at Wankhede, whereas Kings XI Punjab are coming after a great win over Sunrisers Hyderabad by 6 wickets at the PCA Stadium in Mohali. If we talk about the current positions on the points table, Mumbai Indians with 3 wins from 5 matches are placed fifth and are close enough to burst into the top 4. On the other hand, Kings XI Punjab have been playing really good cricket and have won 4 of their 6 games which means with 8 points they are placed third on the points table. After Delhi Capitals, it’s the Kings XI Punjab who have always given a tough fight and a run for their money to Mumbai Indians. Both teams have been involved in many intriguing battles in the past with the latest one being played in this edition only at Mohali where KXIP registered a comfortable 8 wickets victory. In the head-to-head scenario, Mumbai Indians pip the Kings XI Punjab by just one game as they lead 12:11 from 23 matches played between the two teams so far. The red-soil at the Wankhede generally favors the batsmen with the seamers getting some assistance from the surface. With short boundaries all around the stadium high scoring matches generally take place here. Kings XI Punjab have been tinkering with their eleven a lot. They might tinker in this game as well. Mumbai Indians haven’t been good with the bat as most of their batsmen haven’t been in great form. 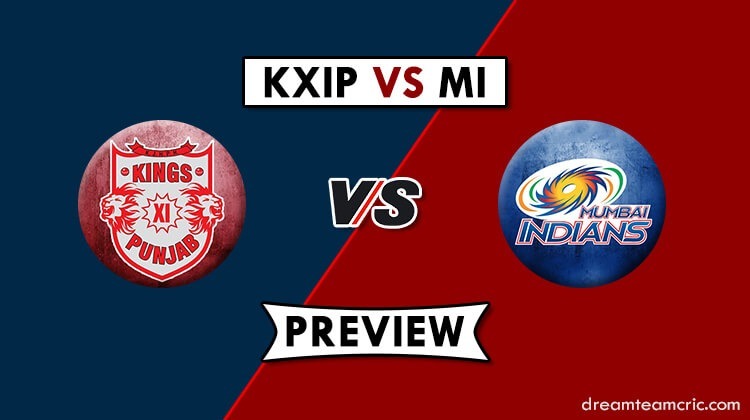 Kings XI Punjab: Sarfaraz Khan, Chris Gayle, KL Rahul, Andrew Tye/Mujeeb-ur-Rahman, R Ashwin, Mayank Agarwal, Mohd Shami, Sam Curran, David Miller, Mandeep Singh, Ankit Rajpoot/V Chakravarthi/M Ashwin. Mumbai Indians: Suryakumar Yadav, Jasprit Bumrah, Ishan Kishan, Krunal Pandya, Rohit Sharma, Quinton de Kock, Kieron Pollard, Hardik Pandya, Jason Behrendorff, Rahul Chahar, Alzarri Joseph. Mumbai is playing at their home in Wankhede therefore, they will definitely have the home advantage. here’s a team which will feature more of the Mumbai Indians performing players. The Kings XI batting line-up has been doing all good things so far. KL Rahul and Mayank Agarwal have been instrumental in Kings XI Punjab’s success. Here’s a team which will focus on KXIP’s batting strength.